Modern students of the Battle of Antietam owe a large debt to Ezra A. Carman. Colonel of the 13th New Jersey Infantry and then brigade commander, he devoted much of his later life to preserving the history of the battle and the newly established National Battlefield Park. Included in these efforts was a manuscript detailing the Maryland Campaign of 1862, written with extensive input from surviving veterans from both sides. Unpublished during his lifetime, it has since been released in several versions. 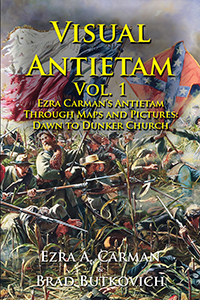 The Visual Antietam series publishes Carman's manuscript with a heavy emphasis on maps and photographs. Visual Antietam Vol. 1: Ezra Carman’s Antietam Through Maps and Pictures: Dawn to Dunker Church contains sixty-three (63) images, both period and modern, allowing the reader to see the battlefield today and as it was only days after the battle. Twenty-six (26) original maps intricately detail troop movements that fateful morning. Available at Amazon.com, online retailers, and in stores.